Regarding BC’s problem transporting his inherited concrete garden roller: Maybe he should be allowed to tow it all the way home, and thus possibly help flatten all the crappy pothole repairs. The state of disrepair of our roads is a disgrace. I live in the Fylde between Preston and Blackpool. The roads are very dangerously damaged and poorly botched in a vain attempt to repair, if any repair has been made at all. Some potholes are death traps for motorcyclists. The road network (including motorways) seems to be literally falling apart in front of us without any semblance of a response from the authorities. I really fear for the future. The crazy thing is that, during the last labour government, funds that should have been spent on road maintenance were diverted into "traffic calming measures" (which I renamed "traffic harming measures" in my campaign against them for the damage they do to vehicles). Lots of dirty money was made by sleazy contractors, councillors and local government officials from this. But the government of the day was directly responsible for providing the funding for "traffic calming" to local authorities and withholding it for "road maintenance". Corruption in a Labour Government? Surely not? The former prime minister of the day, who was on a salary of £140,000 pa, now owns half of a West London block worth around £20,000,000. How did that happen? I thought you might be interested to see the attached photographs taken by a local councillor friend of mine of the supposed traffic control cushions that the County Council have lumbered Bicester with along Middleton Stoney Road. As I tried to say to the Oxfordshire Highways department before they were installed, they would have excessive wear on the slopes to each side as the traffic tries to straddle them. With all the recent cold and wet weather these fairly recent lumps in the road have indeed broken up. 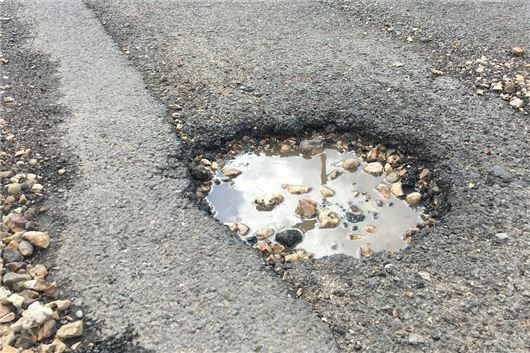 Unlike potholes that are able to be dodged, the breaking up of the side slopes leaving sharp edges will seriously damage the inner sidewalls of tyres. The owners of vehicles will not notice this but the damage to the sidewall carcass is likely to let go at speed, as you have often mentioned. Basically, every one of the road humps has damage to the side slopes over the full length of the Middleton Stoney Road. I dare not drive this route as my BMW i3 has very low profile tyres. I cannot believe the Highways department can leave these ragged edges for vehicle to be damaged. On a more amusing note, if it wasn’t serious, I also noted in my objection to the installation of these things that if it snowed, it would prove impossible for a snow plough to be able to get down to the road at the sides and is likely to ram into the facing slope, damaging the snow plough or the road hump. These photos and all the dangers of these stupid things need to be raised to ministerial level to get them removed. The damaged side slopes are more apparent when viewed from a driver’s eyeline and photographed at a lower angle. I am currently driving a Honda Civic auto, which I like, but it is getting too low for me in my dotage. I would like to stick with Honda because the dealer is so good, but I don't like the Jazz and the Honda HR-V is really too big. The Mazda CX-3 might be suitable. What auto gearbox does it use? Is it a torque converter? I drove the 6-speed transmission in the Mazda 2 1.5 and in the Mazda 3 2.0 litre 120PS (which is the same set-up as in the CX3), and drove three CX-3s here: /road-tests/mazda/mazda-cx-3-2018-road-test/ and that's the basis of my recommendation. The Mazda 6-speed is the best torque converter transmission in any small car. Absolutely no faults reported. Just over a month ago I purchased a 75,000 mile 2010 Mercedes-Benz E350 Bluetec Avantgarde estate from a Mercedes dealer, as a replacement to my much loved 1995 W124 E320 estate. Despite reading many reviews and watching many videos on YouTube the new car’s ride is not as expected. I feel every road imperfection, even on motorways and it is very hard work to live with. I have been on a test-drive in my car with the main dealers workshop manager and he says this is how they ride and even took me out in a newer car same model and the driving experience was very similar. I lowered the tyre pressures and this has made no difference. Is there anything else I can do? If not what would you recommend as a fast and comfortable second hand replacement? Ideally an estate but it's not crucial. Budget £12k to £14k. You have not mentioned the most likely reason for this, which is the tyres. What size are they? Tyres with a 65 profile (the likely profile on your W124) cushion potholes far better than tyres with 45 or 40 profile (which may be the profile of the tyres on your 2010 S212). You can go down to 16-inch wheels with 60 profile tyres, but this will mean changing the wheels. All Mercedes rid a lot better on air suspension and the estates have it at the rear, so worth having the condition of the air suspension bags checked out. I hope you will be able to help me find other VW Sharan and SEAT Alhambra owners in the UK who have has similar problems to mine with their car’s AdBlue heater systems. This is my first diesel vehicle, having been persuaded by the promise of very low emissions by VW. Regretfully, I now find that this has been achieved by adding AdBlue to the exhaust system, and by the well-known cheat of scamming the test results. It wasn’t clear to me that I was also buying into the poor design of the AdBlue system, and I am disappointed by the scam. I have since discovered that the AdBlue system was designed to be a ‘service item’. Mine has now failed and needed a full replacement at a cost of £594.44. This followed the emission adaption 23R7 EA189 NOx in January 2017. I then discovered on the Internet, that in the USA this failure is not uncommon. VW has since replaced faulty AdBlue systems FoC and redesigned the unit. It started with a sign on my dashboard indicating that I had a serious fault, and that I urgently needed to attend a dealership. From that point onwards I was trapped into expensive investigation, and replacement to get my Sharan back on the road. Without the work on my car, I had no car. I have noted and can confirm it is a common fault. See: /carbycar/volkswagen/sharan-2010/?section=good / However, in Summer 2017, VAG issued a pledge that it would fix any issue that could be "consequential" of the NOx emissions fix for a period of up to 2 years from the fix or up to 160,000 miles. So your next step it to revisit your VW dealer who did the fix then fitted the new AdBlue heater and ask him about a refund on that basis. If one isn't forthcoming, take the matter to Small Claims: https://www.gov.uk/make-court-claim-for-money. I drive a Peugeot 307 90HDI SW that has done 110,000 miles. It is a wonderful workhorse and is quite nippy, especially around town. Average fuel consumption was 69.7mpg over 8,784 miles last year taken from the vehicle trip display, so probably a little less than that in reality. The removable rear seats means that by detaching one of them and storing it on top of the remaining rear seats I can carry two bikes if I remove the front wheels. This is why I would like to keep running this car. However, over the last 9 months it has developed an intermittent fault. Power seems to cut out momentarily and kicks back in again but the deceleration is quite marked. It can happen in all gears and at all speeds. For example, on a trip from Wakefield to Portsmouth and the Isle of Wight, this happened after 130 miles of motorway / dual carriageway cruising at 60-70 mph. The rest of the journey to Portsmouth, touring on the Isle of Wight, and back again was exemplary. When it happens, it feels like the fuel supply has been cut off for a second or two. My local garage has been unable to ascertain what the fault could be. It is an independent garage, not a Peugeot franchise, but is normally very good at tracing and rectifying any faults. Have you any ideas, or do I need to start looking for a replacement? If the latter, can you recommended any other vehicles that have removable rear seats and good mpg. Incidentally, I struggle with the concept that a vehicle that does almost 70mpg is more polluting per mile than a newer one that only does 30mpg. Firstly, whether it's the old NEDC lab test, or the new WLTP test, or the new EU6d Temp test or the forthcoming Real Life MPG test, all are based on the emissions from running a car a distance and while CO2 emissions are related to fuel consumption, NOx emissions are not. You don't say what fuel you are running your economical 307 on. But the light throttle openings you must be using will eventually have three effects: they will start to soot up the injectors and the EGR and the DPF, if one is fitted (they were fitted to 307 2.0HDIs; not necessarily to 1.6HDIs). If a DPF is fitted, eventually it will fill up with ash from burning off the soot and will become less effective. Another possibility is the mass airflow sensor. What might help is a dose of fuel system cleaner (Millers, Wynns, etc. ), then switching permanently to the same brand of Super diesel to avail yourself of the same fuel system cleaning additives. But if the EGR is sooted up, that will need replacing and if the DPF (if it has one) is getting full of ash, that either needs chemically cleaning by the Ceramex process (needs to be sent away and the work fully documented for the new MoT starting 20th May) or replacing (upwards of £800). Hope the cheaper and easier fix works. You were kind enough to advise me last December after a serious fault had been discovered with the engine of my Range Rover, 5 weeks out of warranty. RR has now covered 75% of the cost, but I am still arguing over the remaining 25%, mainly because they sold me the car previously owned by them with the promise of full service history that turned out to be non-existent. In fact the “full service history” only amounted to the first service, which is not recorded in the cars history at the time it should have been. This was subsequently carried out 7 weeks after I had purchased the car, and then set the future service reminders for the month of December. In view of the advice you gave ‘AMG man’ on 8th February, would I be justified in insisting that the selling dealer buys the car back at what I paid for it two and a half years ago? Sorry, but I need a quick answer because this Wednesday I’m selling the car for £23,000 less than I paid for it. Your advice is urgently needed. LOL, am I justified insisting the selling dealer buys the car back for the same price I paid for it two and a half years ago?! What are these people on FFS? CW was entitled to a reasonable response from HJ regarding his comments on the state of our pot holed roads. Responding with a rant about the failings of the previous Labour Government, given that they were last in Office more 8 years ago, without any mention of the current Government's more relevant responsibilties for the maintenance of our roads is plainly ridiculous. As is suggesting Tony Blair got rich by pocketing kick backs from speed hump installers. I think being paid millions for speech making world tours may have had more to do with it. A ridiculous assertion. In Labour's time in power, so little was spent on road maintenance that, upon leaving office in 2010, county council backlogs of ALL rpoad repairs was not one year, not ten years but in the HUNDREDS of years for the budgets they had. As HJ says, much of the money was spent on so-called traffic calming measures (which just damaged vehicles, the roads and buildings around them and did little to slow traffic down, as well as INCREASE pollution due to people sharply braking and accelerating. Much of the rest taken away from proper road maintenance budgets (locally and nationally) was wasted on the many other wheezes the then NuLab government came up with. When they left office, there INDEED was 'no money left', hence why huge cutbacks were required, making the situation FAR WORSE. I cannot comment about 'kick-backs', but I do know from being an engineer in the Construction Industry at the time that many firms were getting rich off the backs of often ill-conceived and badly run projects, much of which were driven by 'top' politicians at local and national level, most of whom were, at the time, NuLab. I personally suspect more was going on to spend untold £Bns without much in the way of oversight. It's just the daft TBs£££ conspiracy theory I was questioning. I don't dispute the chronic, misdirected and badly managed road spending in the UK, our roads, or the rutted tracks that pass for them, are evidence enough. A group is campaiging for humps along my local access road as the odd idiot hits 50 down it, past a school. I'm not a fan of speed humps but I am a fan of driving slowly and carefully when required. Quite like the speed sensitive warning signs, is there evidence these are more effective than humps? Simple fact is, some control measure is needed. Unsubstantiated and largely untrue statements from "Engineer" Andy are purely anecdotal and no evidence of what actually happened. Instead of focusing on the past with fake accounts of history, Government attention should be placed on improving the current state of our roads. So, "Mike", how are 'you're' 'statements' 'true' and not anecdotal (which I don't dispute - I said based on my experience). PS. I AM an engineer - graduated 1996 from UCL. Given I don't see much of you commenting in the main forum, you are hardly an expert yourself, and have given NOT ONE piece of evidence to back up your claims. I, on the other hand, managed to gleen my information from searches and remembrance of many media reports over the years, and not just from right-of-centre newspapers. I don't pretend that my opinions are anything other than just that. I don't dress them up with half truths and innuendo to support my opinions. I don't brag about my qualifications. I don't write you're when I mean your. I don't support the Labour Party. I don't often comment in the main forum and don't see that as a prerequisite for having an opinion. I will offer one FACT. On 4 December 2009 the UK's public spending watchdog reported that the then Labour Government had bailed out the banks to the tune of £850 billion. I expect this had some impact on their priorities and spending plans. I will also continue to offer my opinions when I see what I perceive as injustice. I don't pretend that my opinions are anything other than just that. I don't dress them up with half truths and innuendo to support my opinions. I don't brag about my qualifications. I don't write you're when I mean your. I don't support the Labour Party. I don't often comment in the main forum and don't see that as a prerequisite for having an opinion. I will offer one FACT. On 4 December 2009 the UK's public spending watchdog reported that the then Labour Government had bailed out the banks to the tune of £850 billion. I expect this had some impact on their priorities and spending plans. I will also continue to offer my opinions when I see what I perceive as injustice. They had slashed the roads budget WELL before the financial crisis in 2008 (more like 2000), hence why I said there was a backlog of hundreds of years of road repairs, even if the budgets had gone back up to what they were before they cut them and including inflation. This was well documented in the media and wasn't ever denied by the then government. Like after 2008, the Labour government prioritised other spending (e.g. the NHS, welfare) over roads, but mostly spent it unwisely and often had to pour in vast sums more to paper of the proverbial (and sometimes actual) cracks in other spending. I SAW this being done first hand by working alongside the NHS, Education, Police, MoD and other government depts in my job as an engineer whereby they didn't listen to expert advice and made bad decisions about capital and day-to-day spending on projects, buildings etc. Wastefullness on a grand scale. We did as we were told (despite sometimes arguing against them) but had to balance our jobs and companies against taking a stance against bad descisions - doing so could (and did) mean blacklisting on government work, which during Labour's time in office made up more than half of most firms' workload. Regarding the issue raised of the raised 'cushions' by JB of Bicester, my understanding is that The Highways (Road Hump) regulations 1999 will apply. (d) no vertical face of any material forming part of that road hump exceeds 6 millimetres measured vertically from top to bottom of that face. If that is not the case, then I'd suggest writing to the local council to tell them to repair or remove. Again no more facts from "Engineer Andy" only misrepresentations of history fuelled by hate, bile and prejudice; so regrettably I withdraw from further discussion. Oh thank goodness! Nice to see all your rebuttals cached in facts and not feelings. I don't recall any 'hate' in my words, just facts and opinions. Like many SJWs, disagreeing with someone doesn't make them to be some kind of mass-murderer. Funny how they resort to petty name calling when their lack of substance on their arguments gets called out.